This Plugin based upon the well known and good old FuFi.Widgets who accompanied us for years, it was written from scratch to change the look and feel of the Widgets and to make it easier to configure. Also to use the new XAseco features and events for more speed (since XAseco/1.12). Some new features are included to have more information available and easily accessible. The famous feature (i think) is the adjustable clock, no more need to calculate the local time from a Server far away! Also included the BEAT (the Swatch Internet Time), that displays the time which is worldwide the same. Another nice feature are the clickable Record-Widgets to display all the driven records and not just a few in the small Widgets. The extended TMX-Trackinfo-Window display more information of a Track as the default currently does and also in a very nice way. The next very nice thing is the Tracklist where you can easily add a Track to the Jukebox. The integrated filter options makes it easy for e.g. list only Tracks with the mood night or only Stadium Tracks or only Tracks from a selected Trackauthor. Last edited by undef.de on 21 Jul 2016 19:23, edited 76 times in total. i looked about it on your TimeAttack Server and it looks very good. But one question, there are some arrows beside the widgets and I klicked but nothing happen ? What do the arrows mean ? you mean the arrows in circle? Jojo_44 wrote: i looked about it on your TimeAttack Server and it looks very good. But one question, there are some arrows beside the widgets and I klicked but nothing happen ? What do the arrows mean? If you take a look at the first Screenshot, you will see for what this Arrow are. Last edited by dukez30 on 07 Sep 2010 16:14, edited 3 times in total. Ty... pls give me the server link, wanna take a look by myself. i had to remove the Plugin after 15 min because aseco was slowly. I started aseco and it takes some minutes until i saw anything of the widgets. Only with 20 player on the server. 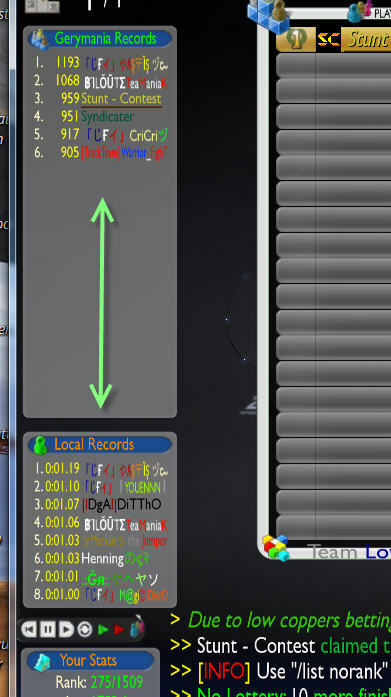 The Dedimania Widget didn´t work at all and the score widget problem at the ende of a race was still there. But if you fix this issues this plugin will be on all my servers because it looks very nice. Maybe it´s only in my case, looking to other betatester too. Do you have the original plugin.dedimania.php overridden with my changed (and included) plugin.dedimania.php? Sounds like you did not. Jojo_44 wrote: i had to remove the Plugin after 15 min because aseco was slowly. I started aseco and it takes some minutes until i saw anything of the widgets. Only with 20 player on the server. At startup from xaseco the plugin need some time for getting all data for the tables at score and this take (depending on the size of the database) 5 sec. till minutes, because the data are preloaded and kempt on-the-fly. The player count is not responsible for that delay. Jojo_44 wrote: the score widget problem at the end of a race was still there. Do you mean that the tables at score after the race has begun still appear? Screenshot? Jojo_44 wrote: But if you fix this issues this plugin will be on all my servers because it looks very nice. Maybe it´s only in my case, looking to other betatester too. Thats why i test it on other servers. undef.de wrote: At startup from xaseco the plugin need some time for getting all data for the tables at score and this take (depending on the size of the database) 5 sec. till minutes, because the data are preloaded and kempt on-the-fly. The player count is not responsible for that delay. Ok in my case it took longer (ca. 1min) but my database is round about 6 GB. undef.de wrote: Do you have the original plugin.dedimania.php overridden with my changed (and included) plugin.dedimania.php? Sounds like you did not. No I had overriden the plugin but i think it looks like a generally problem of the widgets because the dedi recs loaded but i have not seen the recs in the widget window. I must correct my first post, the problem only occurs from time to time. Also by the normal widgets, so it´s not your problem. undef.de wrote: Do you mean that the tables at score after the race has begun still appear? Screenshot? Maybe you read the thread from tyrann about this problem. I had hope that you do some improvements but the problem is still there. So this is a bug that occurred this weekend! I don´t think that this has something to do with the autoqueue, because the plugin also runs normal when we have some players in the queue. I saw this too (1 time), but only when i came on the server and the round ends at this moment. But this happens also with the FuFi Widget and i don´t think that this is a bug. Last edited by Greco on 16 Sep 2010 11:14, edited 1 time in total. undef.de wrote: If you want to test it, just PM me and ask for the link and write why you are the chosen one for testing it. If you have a Stunts Servers and want to test the Gerymania Plugin for XASECO too, than do not forget to tell that!